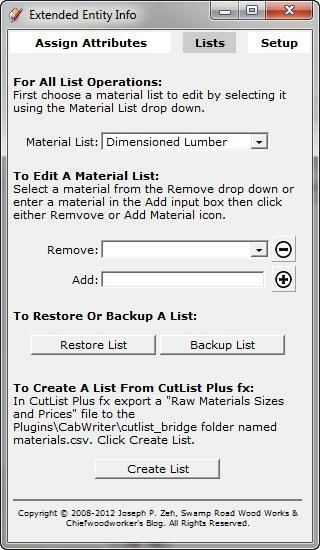 If you use CutList Bridge to export a cut list to import into CutList Plus fx, you need to be sure CutList Plus fx is setup to be compatible with CutList Bridge. This is especially true if you use a non-dollar currency such as the euro. Here is what you need to check. 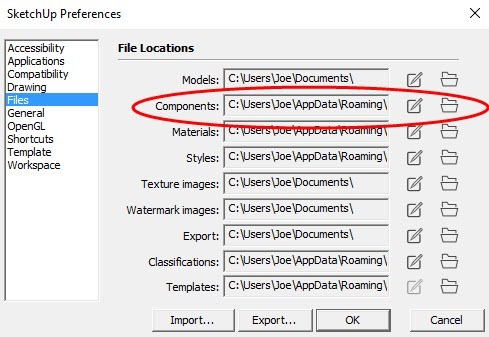 Choose the File Locations tab. 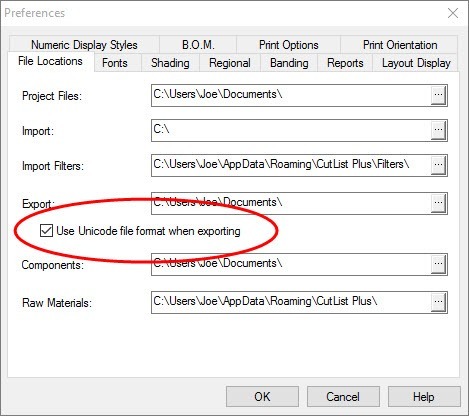 Under Export: check “Use Unicode file format when exporting. If you exported materials.csv files from CutList Plus fx to CutList Bridge prior to performing this procedure you will have to repeat that export/import after this. Consult the CutList Bridge User’s Guide and go to the section called “To Create a List From CutList Plus fx:” for instructions. CutList Bridge 2.5 is now available for download. 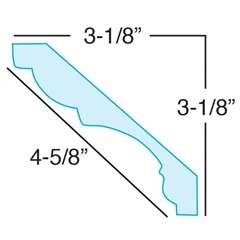 CutList Bridge comes with a CutList Bridge User’s Guide that will explain installation procedures and all features and functionality. 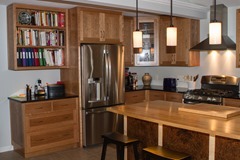 The User’s Guide gives three examples of types of woodworking that benefit from its features. You can download CutList Bridge 2.5 with this link. Please report all strange behavior or bugs to jpz@srww.com and don’t hesitate to write if you need help. Version 2.5 fixes a bug introduced in version 2.4 and is a must upgrade. This bug will cause the user to potentially loose work and attributes. In version 2.4 I changed and included code to make it unnecessary to use the Save Attributes key to save attributes. Each input change is saved as it is entered. If multiple components are selected and an attribute is entered or changed, only that attribute will be changed in all selected components. Blank fields, unless one or more became blank due to an intentional change, will not be written to all components. This eliminates the need for the Save Attributes button. The button remains but is harmless and it will be removed in version 3.0. In the process of making this change to version 2.4 I introduced a bug that is fixed in version 2.5. Sorry folks. Download the CutList Bridge User’s Guide and locate the Installation section in the index. 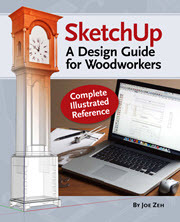 After reviewing this section also review Installing Ruby Plugins and follow the instructions under the heading “Older versions of SketchUp and .rb files”. I have begun a series of tutorial videos to help you learn the features of CutList Bridge. Part 1 of 3 was recently released and can be found at CutList Bridge Tutorial – Part 1. Part 2 was released today and can be found at CutList Bridge Tutorial – Part 2. Stay tuned for Part 3. If you are a MAC user and have the latest Safari Version 6.0.2 but do not have the latest OSX Mountain Lion installed, you will not be able to use CutList Bridge to add component attributes. Safari 6.0.2 in older versions of the OSX make text input fields black instead of white masking the black characters entered by the user. This is a MAC problem and not a CutList Bridge 2.5 problem. Download alternate_cutlist_bridge_css.zip by clicking on this hyperlink. 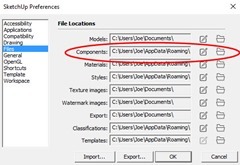 Extract the file cutlist_bridge.css from the ZIP folder and move it to the folder …. \Plugins\cutlist_bridge\cutlist_bridge (note the two levels of cutlist_bridge folder). This replaces the file of the same name that is already in your Plugins file under folder \cutlist_bridge\cutlist_bridge (note again the two levels of cutlist_bridge folder). Close SketchUp and reopen it. You CutList Bridge input fields will still have a black background, but your entries will be red characters making them visible. There are three models which you can download that already have attributes assigned. 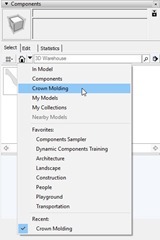 You can use these models to produce a cut list and experiment with changes to the attributes. 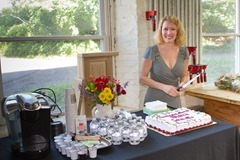 The Shaker Tall Clock demonstrates most of the basic features of CutList Bridge. 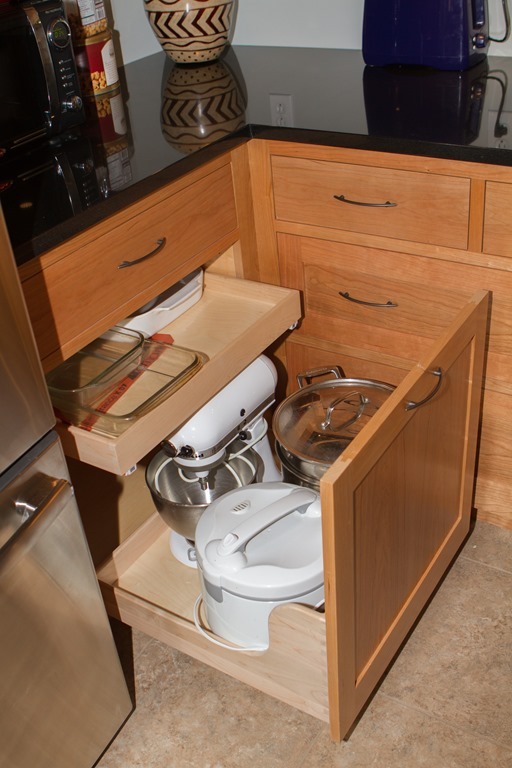 Base Cabinet, thanks to Matt Richardson and Greg Larson of NESAW, demonstrates most of the special Cabinet Mode features. 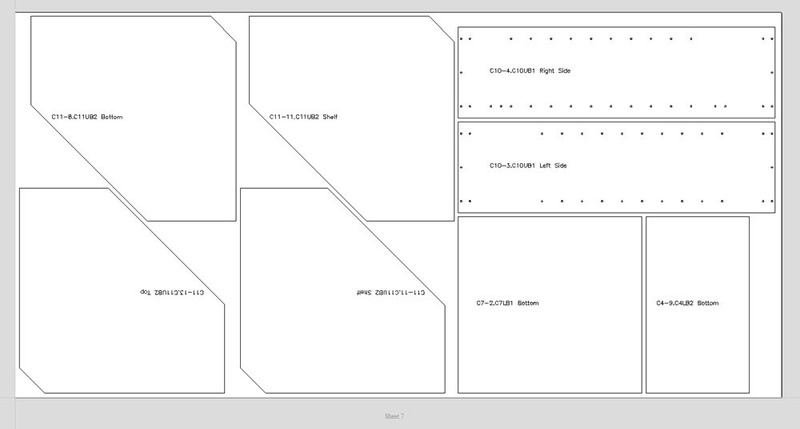 SketchUp Home demonstrates a very large cut list whose Sub-Assembly names are automatically generated with the Sub-Assembly by Layer feature. Click the links below to download each model. 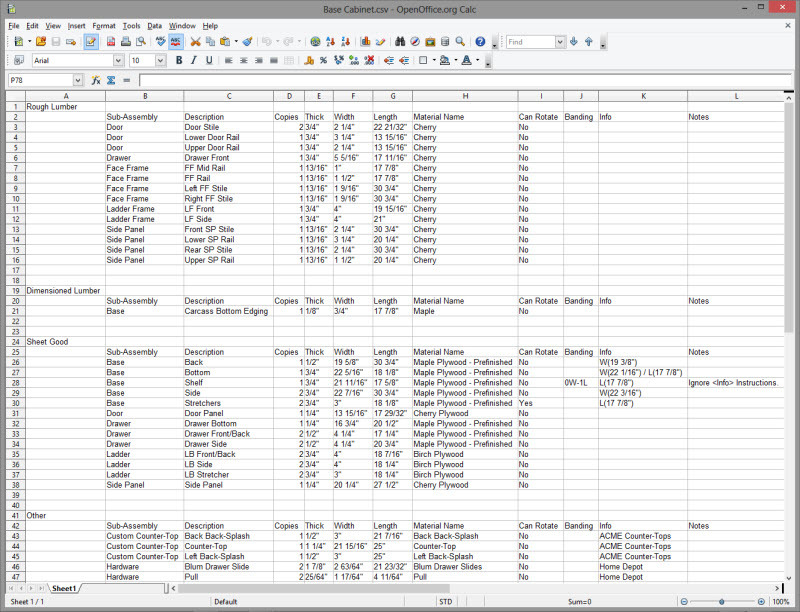 Below is an image of a SketchUp cut list exported to OpenOffice. Not all lines are shown. You may not be aware, but there is a free application called OpenOffice that is largely equivalent to Microsoft Office. It can be downloaded at http://download.openoffice.fm/free/ . One note of caution; there are a few extra applications that get installed with OpenOffice that are marketing data gathering software. You are supposed to be able to opt-in at install time, but the opt-in process is so obscure that most people will miss it. However, you can remove these application after installation if you miss the opt-in process. 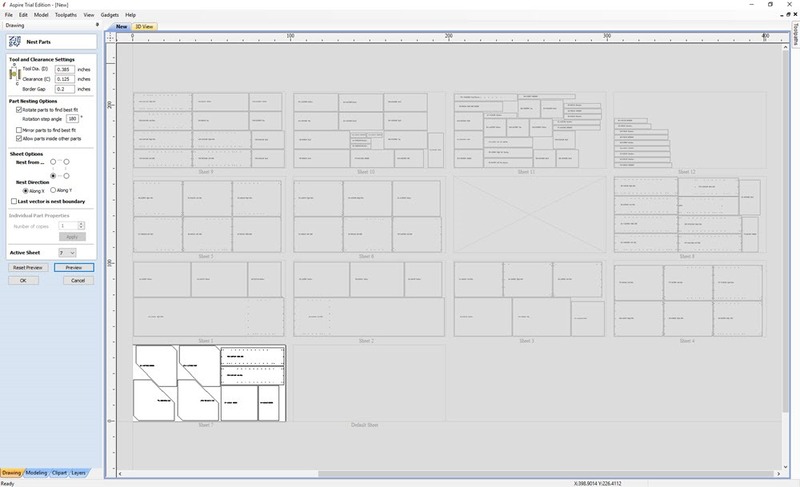 I have downloaded Open Office and gave it a test drive with CutList Bridge 2.0. It works with one very minor problem. 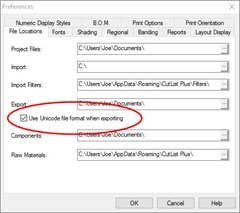 First, when exporting from SketchUp use the File/Export to Microsoft Excel command. Next, when importing to OpenOffice Spreadsheet use the File/Open command with All files (*. *) selected for Files of type:, and then a dialog box will appear. See the image on the left (click to enlarge). 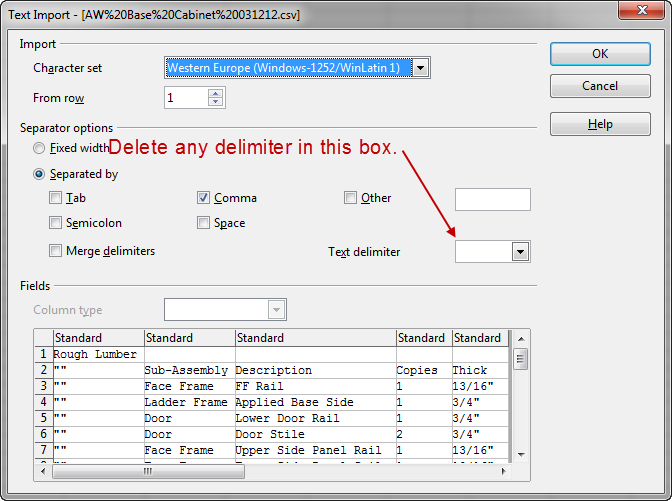 Clear any single quote or double quote (‘ or "") in the Text delimiter drop down box. You don’t have a choice of blank in the drop down, but just select any character(s) in that box and delete them. Make sure you have the Comma check box selected and none other. Hit OK and you will get a cut list similar to that shown in the image at right. The double quotes in the left hand column should not be there. They are a result of a bug I have in my script which Excel overlooks, hence I have never seen it. I will fix it in the next bug fix release. This bug does not affect either CutList Plus or Excel. 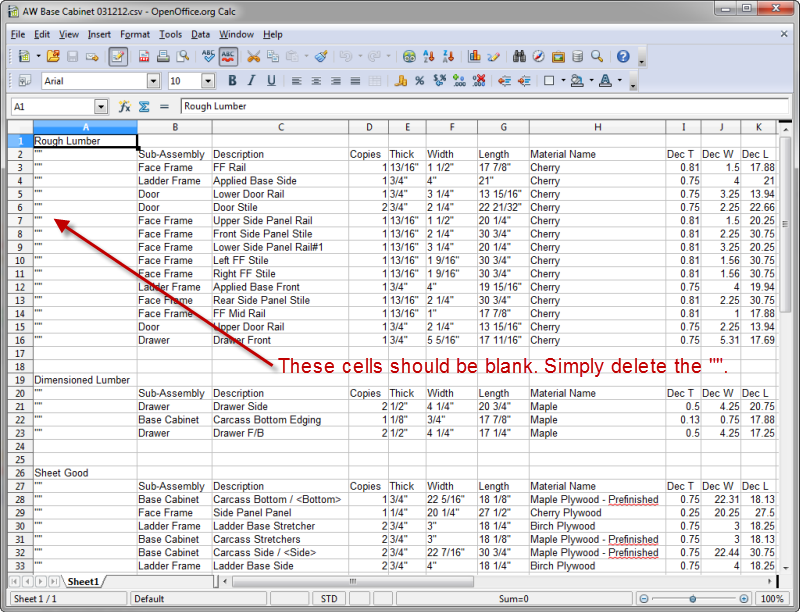 Simply select these cells and delete their content. So far I am quite impressed with Open Office. I don’t know why I haven’t tried it before today. 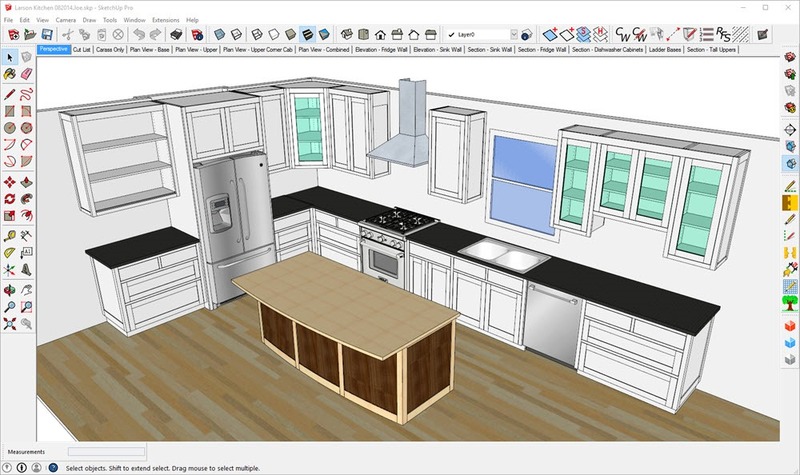 If you are looking for a complete free solution from 3D modeling of woodworking projects to shop cut lists then the combination of SketchUp, CutList Bridge 2.0 and OpenOffice is your answer. 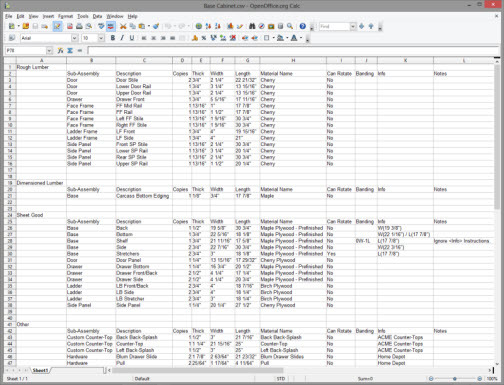 At the suggestion of Greg Larson, owner and operator of the New England School of Architectural Woodworking, and with his help, I have developed a cut list export tool for SketchUp. Why another cut list tool? Don’t we have enough already? 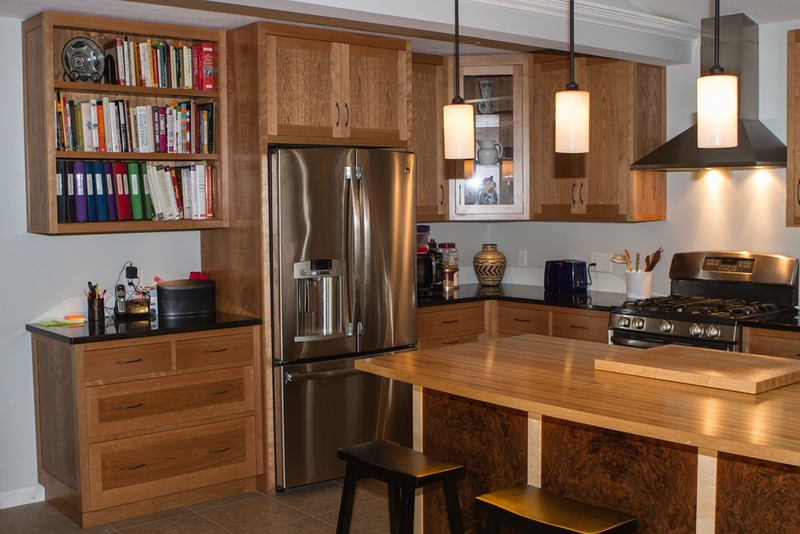 Well, this has some unique features that are tailored to architectural cabinetmaking design and build, though these features can be used for all types of woodworking models. This release is Revision 1.0. It comes with a CutList Bridge User’s Guide that will explain all features and functionality. 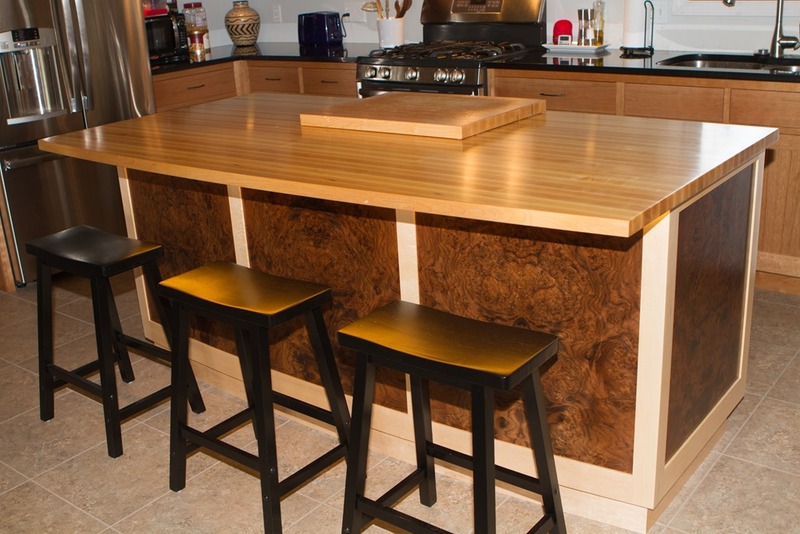 The User’s Guide gives three examples of types of woodworking that benefit from its features. You can download CutList Bridge with this link. Please report all strange behavior or bugs to jpz@srww.com and don’t hesitate to write if you need help. 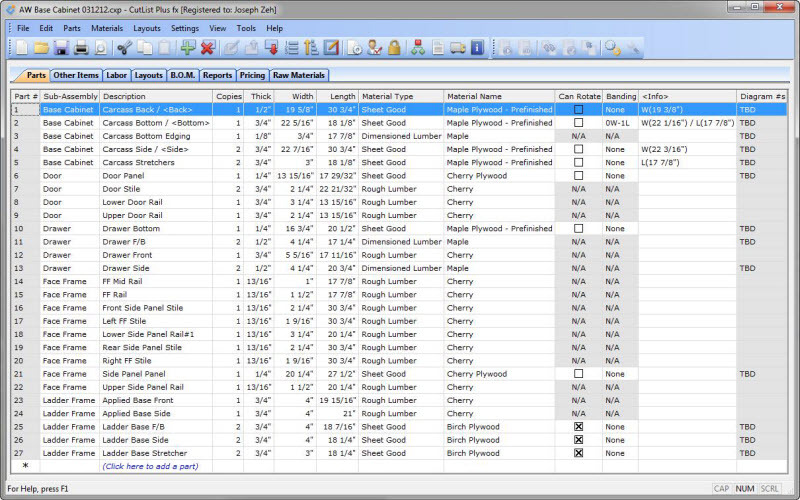 CutList Plus fx is a highly functional cut list creator, costing tool, proposal generator and inventory manager for woodworking shops. 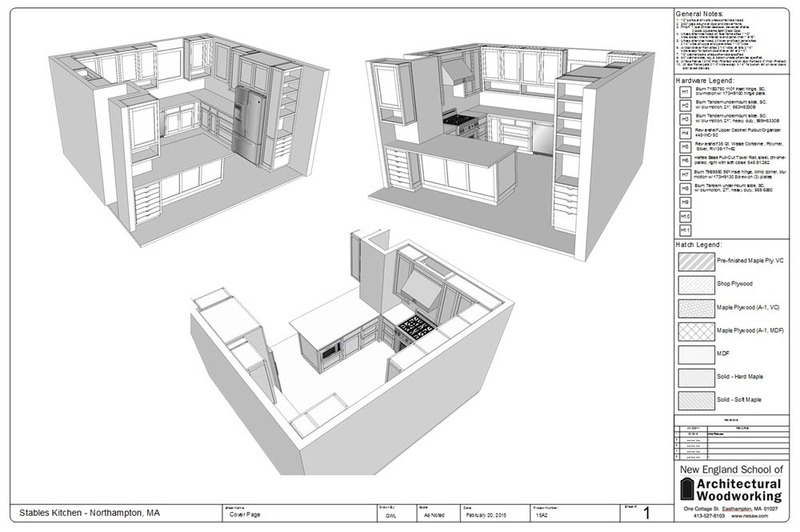 Google SketchUp is a powerful 3D drawing tool ideally suited for furniture and architectural cabinet design and photorealistic rendering. These two tools do not naturally work together. 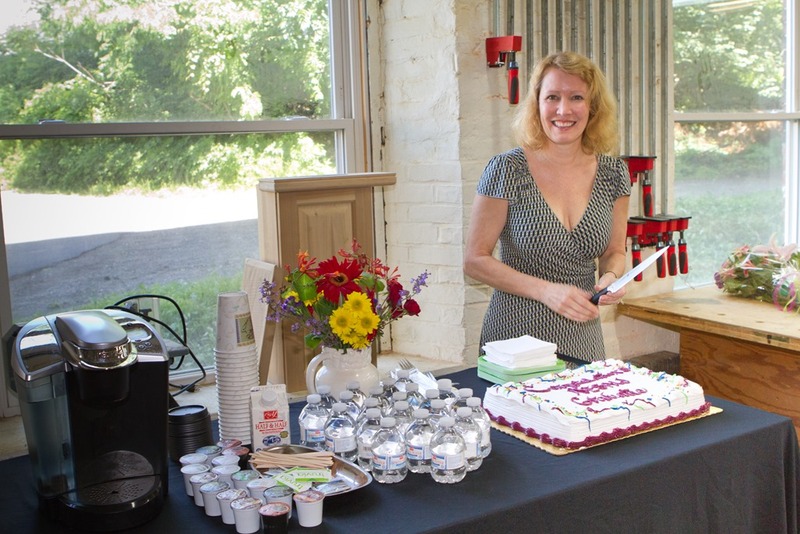 CutList Bridge solves that problem by seamlessly bridging these two applications. If you do not use CutList Plus fx, no problem. 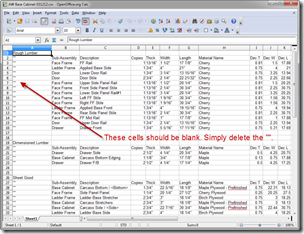 You can export your cut list to Microsoft Excel. 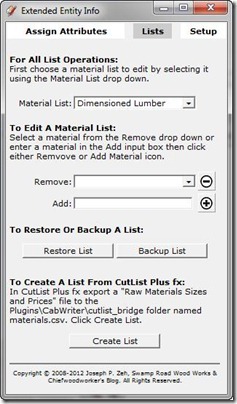 CutList Plus fx requires the user to manually re-enter dimensions and other component attributes such as material type, material name, notes and banding. 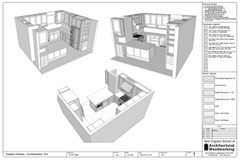 Attributes that can be generated automatically from the design’s 3D model and which ideally belong with the design file. CutList Bridge allows the user to enter and store all attributes with the model file and provides features for editing and exporting. 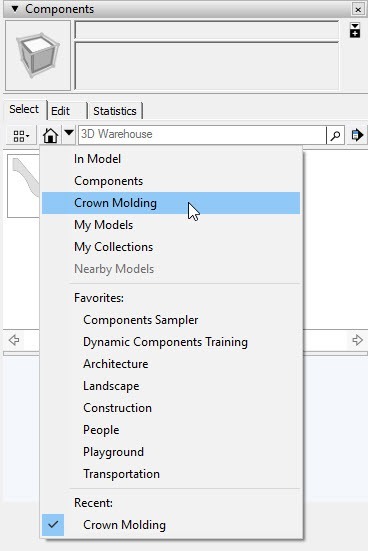 Attributes which can be automatically generated from the 3D model, such as component dimensions and grain direction corrections are also handled in CutList Bridge. In CutList Plus fx a Sub-Assembly name is typically used to group a collection of components. 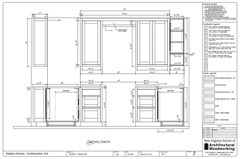 For example: in a model of a chest-of-drawers you may want two Sub-Assembly names; one called Carcass for all the components that make up the basic support structure, and one called Drawers for all components that make up the drawers. A grandfather clock may have Sub-Assembly names of Hood, Waist and Base. 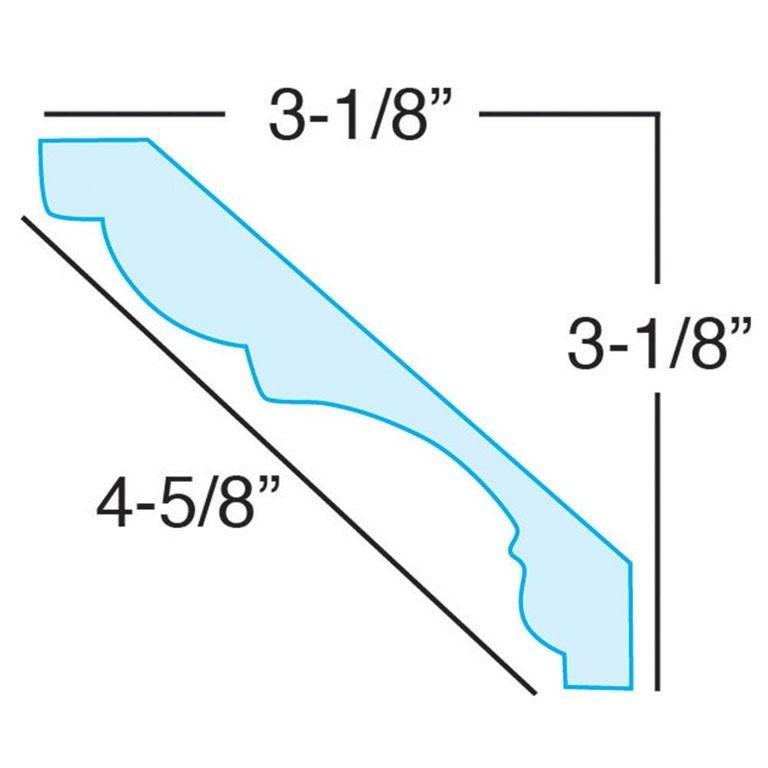 A trundle bed might be divided into Headboard, Footboard, Sides and Trundle. 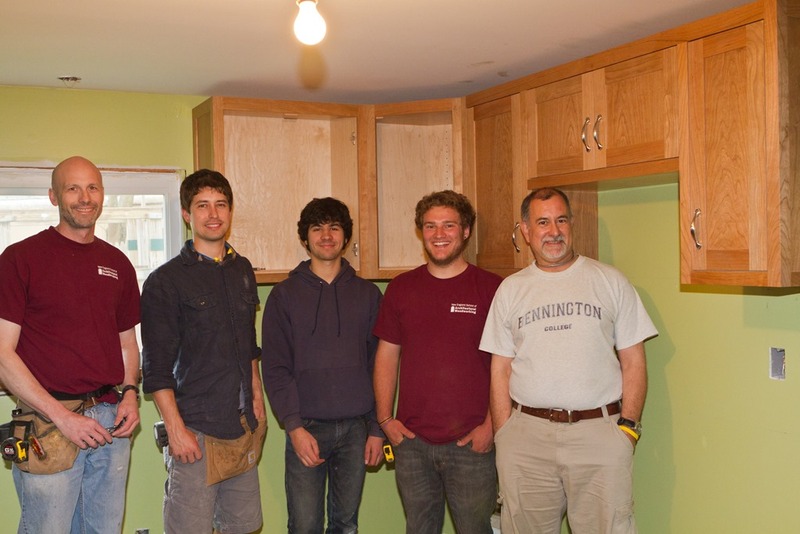 A kitchen cabinet may have sub-assemblies of Cabinet, Face Frame, Drawers and Doors. 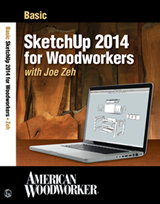 CutList Bridge allows the user to assign Sub-Assembly names in SketchUp prior to exporting to CutList Plus fx. 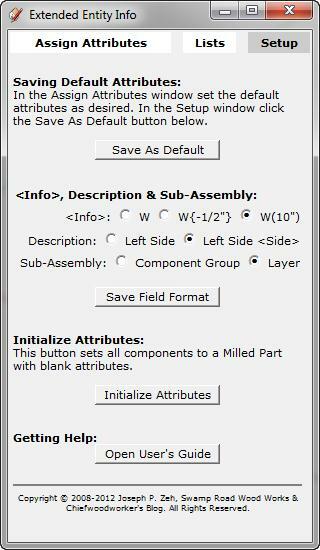 Sub-Assembly names can also be assigned by layer using the layer’s name. 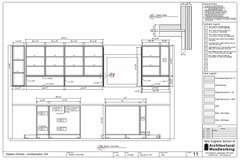 For example, as stick frame house designed in SketchUp may be organized with layer names such as Footing, Foundation, 1st Floor Joists, 1st Floor Framing, 2nd Floor Framing etc. These layer names can automatically be used as the Sub-Assembly names in CutList Bridge fx. <Info> is a CutList Plus fx field that is intended as a short note. However, it has two significant differences from the Notes field provided by CutList Plus fx. First, <Info> shows up in the CutList Plus fx spreadsheet whereas Notes only appear on the Parts printout. Second, if a CutList Plus fx spreadsheet is locked to prevent accidental change, <Info> can still be changed allowing for cutting status to be input. 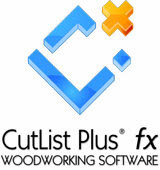 See the CutList Plus fx User’s Guide for more information. CutList Bridge extends the use of <Info> when used in a special mode called Cabinet Mode. 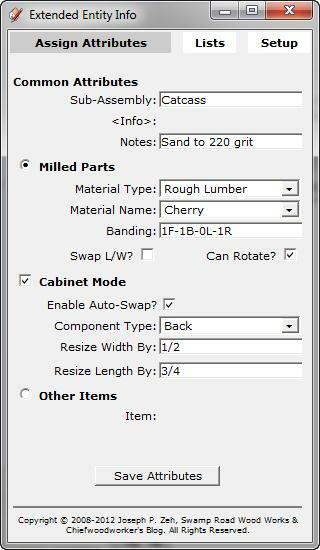 In Cabinet Mode parts can be oversized or undersized in length and width using the Resize feature, and these dimensions will appear in the CutList Plus fx <Info Field>. 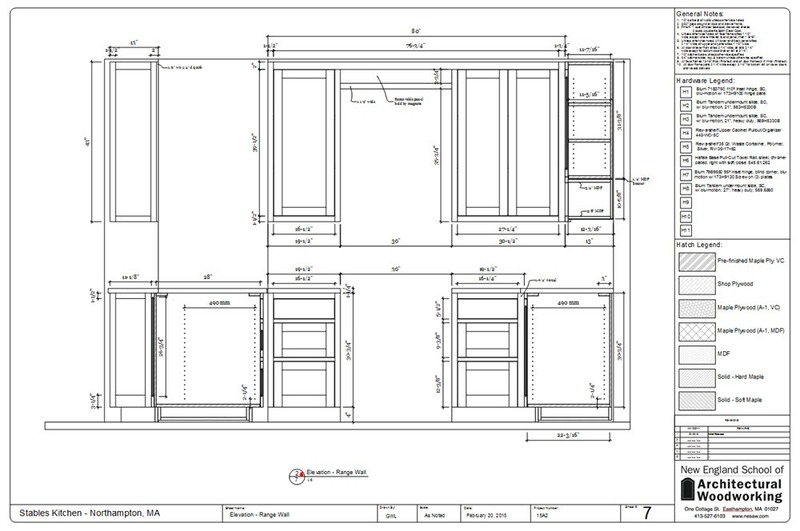 The user has the choice of displaying the increment of over/under size or the over/under sized finished dimension for each of width or length. 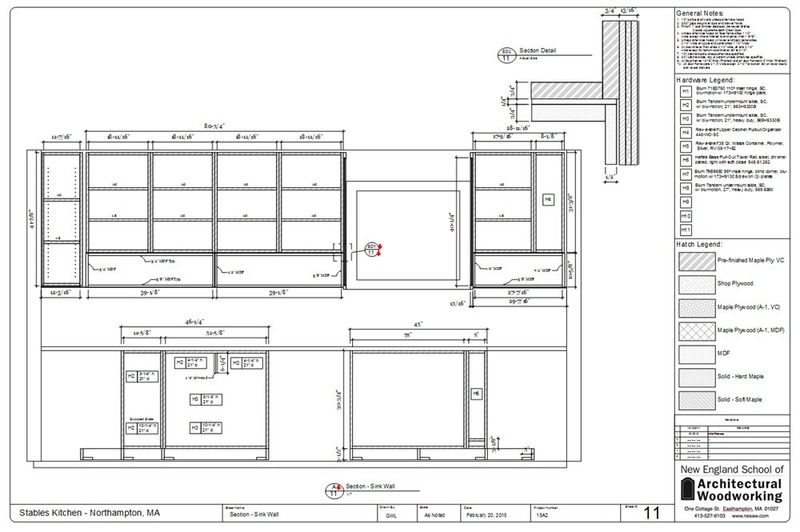 Notes can be assigned in SketchUp for each component. These will be exported to the Notes field in CutList Plus fx. CutList Plus fx supports two classes of components: Milled Parts, which are typically Rough Lumber, Dimensioned Lumber or Sheet Goods that are milled into a component in the shop. CutList Bridge also supports Other Items such as drawer pulls, consumables such as screws, biscuits, dominos or any other non-milled components which are typically purchased. 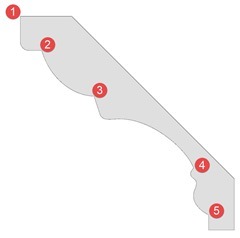 c. Banding – A code to indicate which sides are banded and which banding material to use. 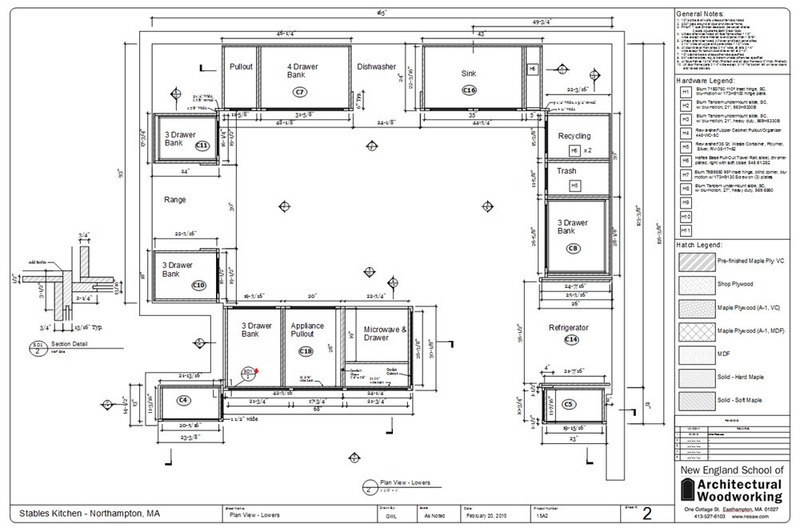 d. Swap L/W – The user can specify in SketchUp any component whose length and width should be swapped. CutList Plus fx assumes the length field specifies the grain direction. 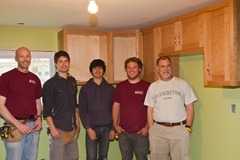 However, there are times when the short dimension of a board should be the grain direction. Check Swap L/W to accomplish this. e. Can Rotate? 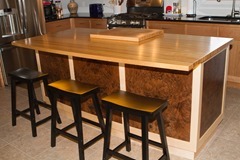 – Many material types have no grain. To assist CutList Plus fx in optimizing material use you can specify in SketchUp which Components can be rotated by CutList Plus fx. Cabinet Mode is a sub-mode of Milled Parts. It is selected in CutList Bridge by checking its checkbox. When selected <Info> is no longer available in the usual way. 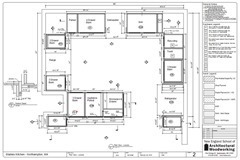 However, when selected another very useful and key option becomes available in addition to three more fields. a. 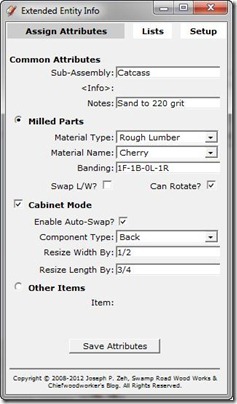 Enable Auto-Swap – This is a feature that automatically determines which components should have their lengths and widths swapped, independent of dimensions, based on a Component’s Type. 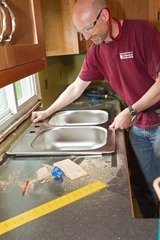 In cabinet design there is a basic box with components that can be labeled Back, Bottom, Shelf, Side or Top. Based on these attributes L & W will be automatically swapped when needed such that grain runs up a side, across a top, down a side and across the bottom to the starting point. Back grain will always be in the vertical direction. Shelves will have a grain direction that is horizontal (side to side) while its cross grain direction is perpendicular to the Back’s plane. b. 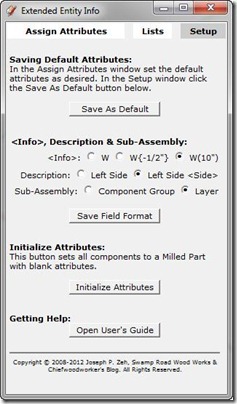 Component Type – As mentioned is assigned with a drop down list and can be either Back, Bottom, Shelf, Side or Top. c. Resize Width By – The user can specify a dimension to resize the width by (the increment, or decrement when preceded with a minus sign). The Width column in CutList Plus will contain this resized dimension. d. Resize Length By – The user can specify a dimension to resize the length by (the increment, or decrement when preceded with a minus sign). The Length column in CutList Plus will contain this resized dimension. The user is able to choose display options for the <Info> and Description fields that will modify what information appear in these fields in CutList Plus fx. More on this later. 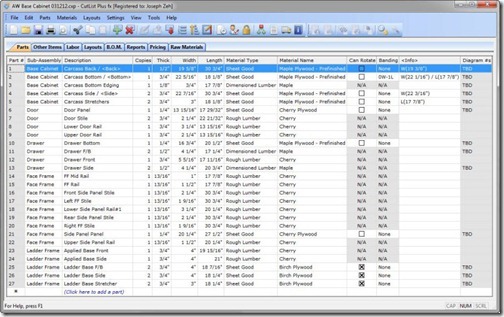 Components that are not milled in the shop, but are purchased, may be specified in the Other Items’ Item field. 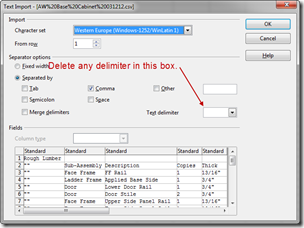 If the name specified in the Other Items’ Item field exists in the Raw Materials library of CutList Plus fx this component and its quantity will be appropriately categorized and added to the BOM in CutList Plus fx. If the name specified does not exist in CutList Plus fx it will still be imported but added to the [Not Categorized] Other Items category. Exporting a .csv file from SketchUp is as simple as selecting a complete model and choosing menu command File/Export to CutList Plus fx. That’s it. A .csv file is generated with the same name as your .skp model file name and placed in the same folder.